Today is National Coffee Day! To celebrate, many coffee places are offering specials to their patrons. Here’s some information for you. If you frequent Cumberland Farms, text the phrase FREECOFFEE to 33733 for a coupon for free hot or iced coffee (any size) via mobile coupon. Perhaps you are a DD mom and love Dunkin Donuts. They’re offering a free hot or iced medium cup of Dark Roast Coffee today (limit of one per person). At-home coffee-lovers may visit www.EightOClock.com to receive a free sample of edible treats “Coffee Thins”, which are made from 100% whole coffee beans. If you’re lucky enough to live close to a Krispy Kreme, visit participating locations for a free original glazed doughnut and free 12-ounce cup of coffee. Many participating McDonald’s locations will offer customers free small hot McCafe coffees. My favorite convenience store Stewart’s Shops is offering customers free hot or iced coffee – any size, any flavor – any time after 3pm today. New Jersey and Pennsylvania moms, we know you love your Wawa stores. Stop in today for free coffee all day today – any size! Many moms prefer Starbucks. While the upscale coffee chain is not providing free coffee today to celebrate National Coffee Day, they are making a commitment to distribute free coffee trees to farmers. They have ensured that one coffee tree will be planted for each bag of coffee purchased in a participating U.S. store through September 2016. 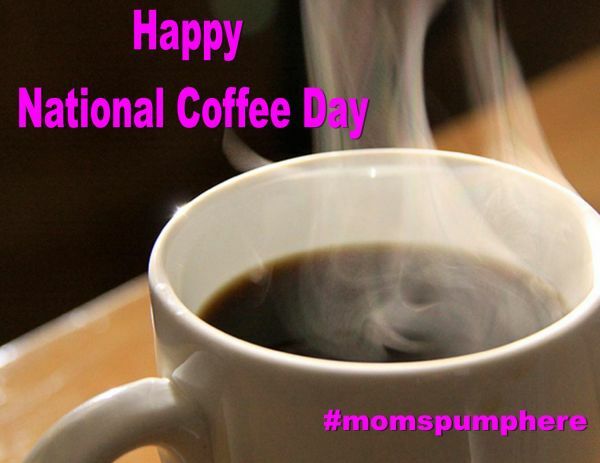 No matter where you get your Frappuccino, Mochachino, French Vanilla Latte or Tall Decaf beverage today, celebrate National Coffee Day and visit Momspumphere.com for more great ideas to enjoy being a mom!